Durban is a popular all-the-year-round holiday resort city, on the warm East coast of South Africa. Greater Durban YMCA is located in the Albert Park area of Durban’s inner-city. This community has 52 taverns in one square kilometre; a beautiful park which is infested with vagrants and drug dealers; legal and illegal immigrants living in slum conditions, being exploited by slum landlords. We occupy a 9 storey building on Diakonia Avenue. Our varied and exciting programmes are for the benefit of children, young people and adults living in the Albert Park area. 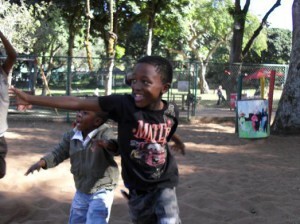 Our facility in Kwa Mashu is the venue for programmes aimed at children and youth. Durban YMCA is a registered NPO and is affiliated to South Africa YMCA, the Africa Alliance of YMCAs, which link us to the World Alliance of YMCA’s; it is therefore part of an organisation with 45 million members in 125 countries around the world. We offer student accommodation to UKZN during the academic year, and comfortable and affordable accommodation for visitors from around the country and around the world during the University vacations..
We serve over 5,000 young people with a variety of programmes aimed at improving their lives and equipping them for life, leadership and service.